Covered call ETFs have become quite popular lately. Living in Canada, I have been holding a couple Canadian members of this family for the last few months. When I purchased them, I liked the benefits and since I wasn’t expecting any bull markets on the horizon, I bought some. These were new products back them, so I promised myself to do some more detailed analysis at a later point. Today was that later point. I took Horizons HXT and HEX ETFs. There are more details on the web site, but in general, HXT is a TSX60 ETF with re-invested dividends, while HEX is the covered called version, paying dividends on monthly basis. HEX was introduced in April and I made my purchase a few months later. Before jumping to the results let’s try to state my expectations. 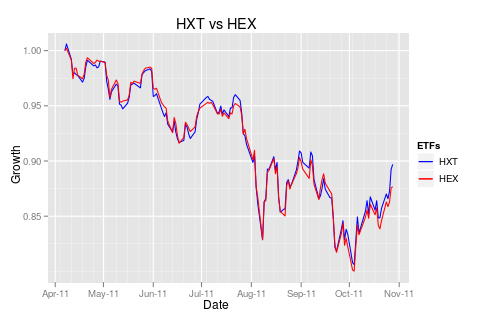 I was expecting after dividends HEX to outperform HXT. Seriously, weren’t the last few months the “best” by definition environment for covered call ETFs? Let’s put it this way – I am disappointed by this chart. Not only the covered call ETF performed worse, it did so with the same level of volatility (just eyeballing the chart). There is even more to it – the above chart assumes perfect dividend re-investment. While there is DRIP in Canada, there are no fractional shares. It’s probably insignificant, but certainly something to keep in mind for products that yield 10-20% annually. Last but not least, HXT does not pay any dividends – they are reinvested and as of recently, its trading is free if your stock broker is Scotia iTrade. The above chart is not the only tool I used for this analysis, I also maintain a spreadsheet to track the exact performance of these ETFs. Unfortunately, the results of my spreadsheet looks similar to my chart. The moral of the story – if something looks too good be true, probably it is. The media hype is always a suspect, even from reliable sources like the venerable BNN.